No. 3 train departing New Lots Avenue on the IRT Brooklyn Line, viewed from Van Siclen Avenue. Photo by: David Tropiansky, July 2010. The Eastern Parkway line, known as Route No. 12, is a four-track extension of the First Subway in Brooklyn. It extends from Atlantic avenue under Flatbush avenue and Eastern parkway to Buffalo avenue. It is divided into four sections, Nos. 1, 1-A, 2 and 3. The Nostrand avenue branch of this line has two tracks and extends in subway from Eastern parkway to Flatbush avenue. It is known as Route No. 29, and is divided for construction purposes into two sections, Nos. 1 and 2. The Livonia Avenue branch line, known as Route No. 31, is a three-track elevated line. It will extend easterly from Buffalo avenue and Eastern parkway via East 98th street and Livonia avenue to New Lots avenue. An elevated extension known as Route No. 57 is also proposed at Utica avenue from Eastern parkway to Flatbush avenue. It is proposed to build Route No. 57 as an assessment proposition, the cost to be assessed on the property benefited by its construction. The Brighton Beach connection between the Fourth Avenue subway and the Brighton Beach line extends from St. Felix street and Fulton street under St. Felix street, the Long Island Railroad station and Flatbush avenue to the Brighton Beach line. For convenience parts of this New York Municipal line have been included with contracts for Interborough Rapid Transit Sections Nos. 1 and 1-A of Route No. 12. Sections Nos. 1-B and 2-A of Route No. 12 contain New York Municipal tracks exclusively and will be described later. Route No. 12, Section No. 1. — This is divided into two parts. The Brighton Beach connection, extending from Fulton street under St. Felix street and the Long Island Railroad Atlantic Avenue station to and under Flatbush avenue to a point south of St. Marks avenue, is included in Section No. 1 of this route; except that portion of the line under the Railroad Company's station property, which is included in a separate contract section known as Route No. 12, Section No. 1-B. 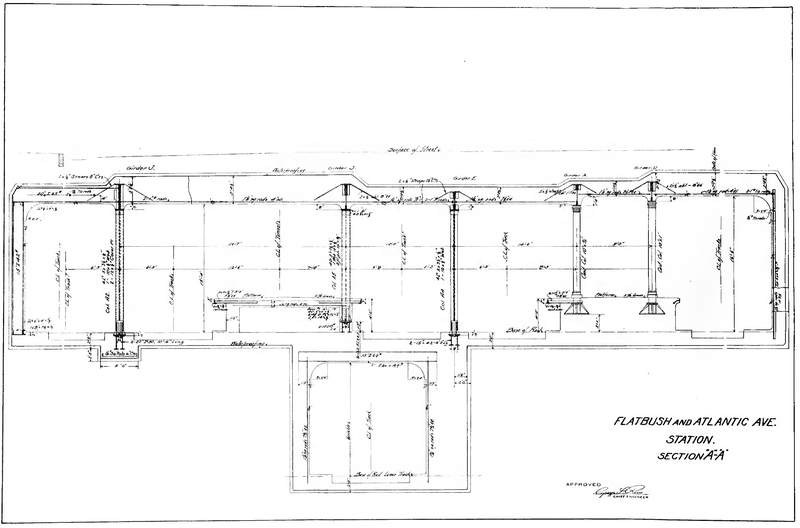 The other portion is a four-track subway extending from the end of the existing subway at Flatbush and Atlantic avenues, under Flatbush avenue to about St. Marks avenue. The contractor for Section No. 1 of Route No. 12 is the Cranford Company, to whom it was let on July 16, 1914. Contract period, 30 months. Summary of contractor's bid, $2,195,296.25. 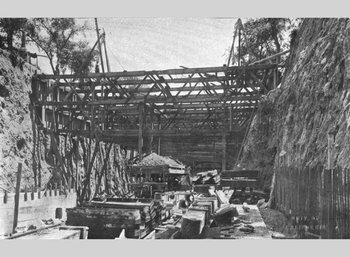 On February 24, 1916, the Public Service Commission approved of change of plan for the structure at Fulton and St. Felix streets to provide for a future connection between the Fulton Street Elevated line and the Fourth Avenue subway. Route No. 12, Section No. 1-A. — This section includes a four-track subway for the Interborough Company, and a two-track line for the New York Municipal Railway Corporation. It extends under Flatbush avenue from about St. Marks avenue to Prospect Park plaza. The Cranford Company, contractor. Date of contract, May 4, 1914. Contract period, 30 months. Summary of contractor's bid, $2,225,519.25. Route No. 12, Section No. 2. — This section is a four-track double-deck structure and extends under Eastern parkway from Prospect Park plaza to a point east of Nostrand avenue. Inter-Continental Construction Corporation, contractor. Date of contract, June 15, 1915. Contract period, 22 months. Summary of contractor's bid, $2,744,263. The east-bound tracks are generally on the upper level, and the west-bound on the lower level. Double-deck construction is used to reduce width of structure to a minimum, thereby saving the trees in the parkway. The arrangement of having one-way traffic on each level is advantageous for the connections with the branch lines, and also is a convenience to the prevailing traffic. The prevailing east-bound traffic will no doubt be exit traffic coming from Manhattan, and the prevailing west-bound traffic entrance traffic to Manhattan. This will result in a short climb and a longer descent for the prevailing traffic. After the contract for this section was awarded, the New York Municipal Railway Corporation proposed to build a station on the Brighton Beach line at Eastern parkway, with a connection to the Interborough Company's Franklin Avenue station of Route No. 12. This plan was approved by the Commission, and necessitated changes in the plans for the Franklin Avenue station and the adjacent structure. A turnout is provided on this section for connection with Route No. 29, in Nostrand avenue. Route No. 12, Section No. 3. — A four-track structure under Eastern parkway extending from a point east of Nostrand avenue to a point near Buffalo avenue, extending thence under private property towards East 98th street near President street, where it emerges from the ground to make connection with the elevated structure of the Livonia Avenue line. Provision is made for extending the subway on Eastern parkway beyond Buffalo avenue. Provision is also made for a connection with the proposed line on Utica avenue. A siding is provided between Utica and Buffalo avenues to provide for future extensions and for operation. Rodgers & Hagerty, Inc., contractor. Date of contract, September 25, 1915. Contract period, 20 months. Summary of contractor's bid, $2,170,052.50. This structure, the same as that for Section No. 2, is double decked, to avoid destroying trees along the parkway. At the end of the routes where the construction changes from subway to elevated, the structure passes through private property in the block bounded by Eastern Parkway, Ralph, East New York and Buffalo avenues. By resolution of the Board of Estimate and Apportionment, the property in this block was to be acquired for park purposes as an addition to Lincoln Terrace park. As the route was located within the proposed park it was designed as an ornamental reinforced concrete structure. 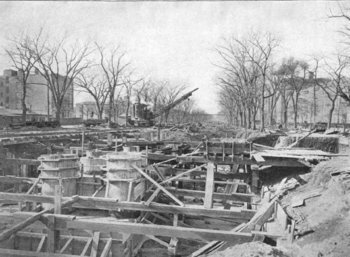 At the suggestion of the Brooklyn Park Department, three archways were provided underneath the structure between Union and President streets to accommodate a proposed pathway at that point. 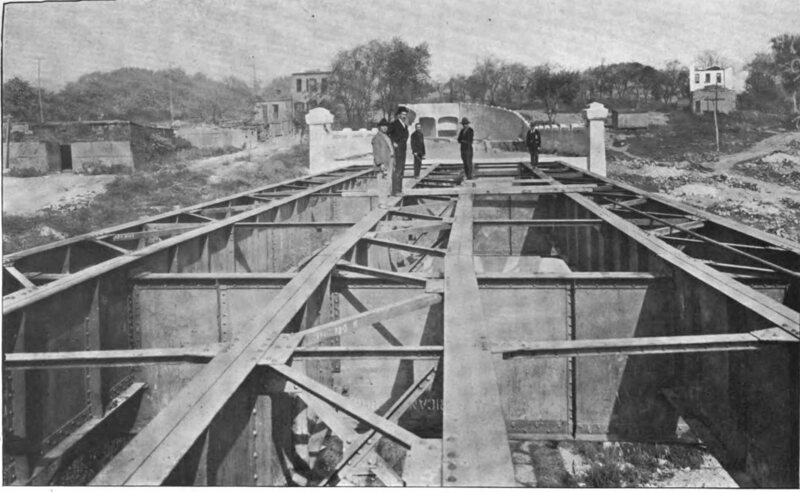 After the contract for this section was let, however, it was decided to acquire for park purposes, only that portion of the property lying west of the subway structure, and a new street designated as Portal street was laid out running alongside of the easterly wall of the structure from Eastern parkway to East New York avenue. In view of this change, the archways were eliminated and reinforced concrete retaining walls were used, a material saving in construction resulting. On account of the required ornamental appearance of the structure, the expansion joints were located at the sides of the pilasters, and the details are such as to make the vertical gaps invisible from the outside. Sheet lead was provided at the expansion joints for closing the gaps and making the joints watertight. Eastern Parkway Line. Trench bracing, contractor's plant, etc. Prospect Park Plaza. PSC report 1914. Eastern Parkway Line. 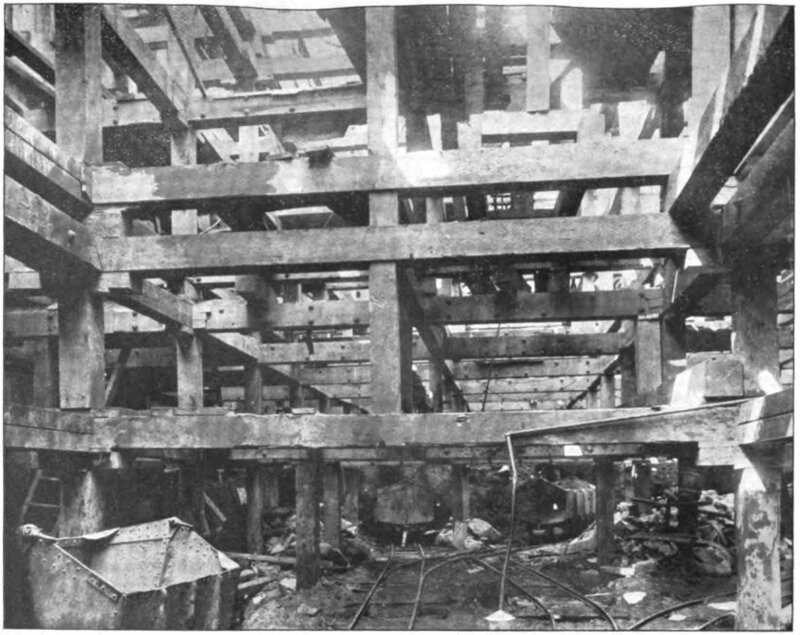 Unfinished Portion of Subway Structure Under Flatbush Avenue. PSC report 1915. Eastern Parkway Line. 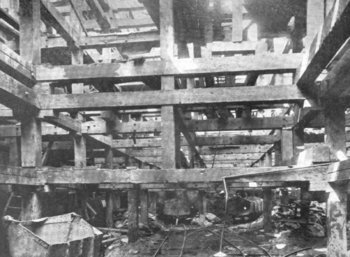 System of Timbering Near the Plaza Shaft. PSC report 1915. Eastern Parkway Line. Temporary Support Columns, Long Island Railroad Station, Flatbush Avenue, Brooklyn. PSC report 1916. Eastern Parkway Line. 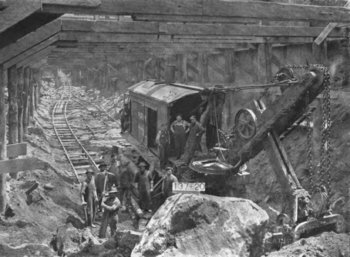 Steam Shovel Operating in Timbered Cut. PSC report 1916. Eastern Parkway Line. Method of Timbered Cut. PSC report 1916. Route No. 81. — This is an elevated extension of the Eastern Parkway route to be constructed as a two-track line, with provision for a future third track. It begins at a point on private property east of Buffalo avenue, and extends over East 98th street and Livonia avenue to New Lots avenue in the Borough of Brooklyn. A yard for the storage of cars along this route will undoubtedly be required. Preliminary studies of such a yard have been made, but the location thereof has not yet been finally determined upon. 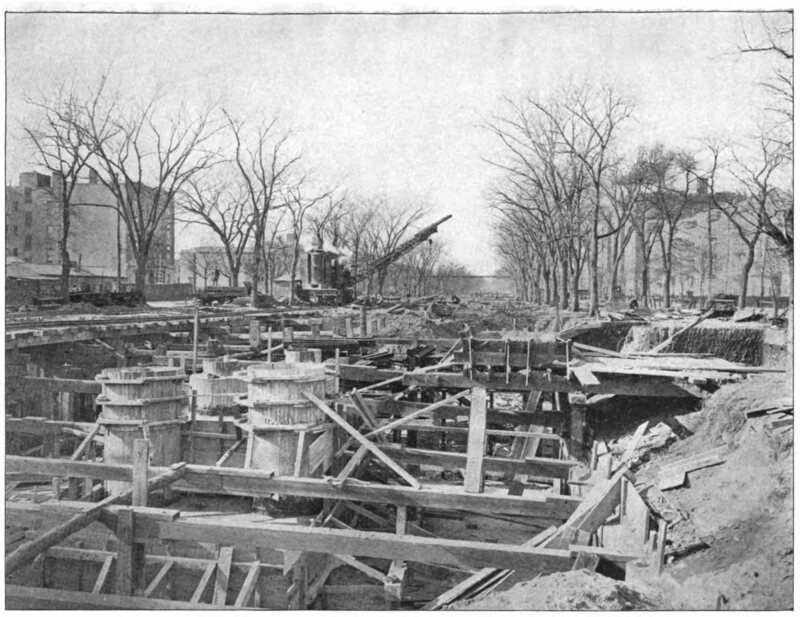 Eastern Parkway Line, Use of Traveling Crane in Construction Work. PSC report 1917. Eastern Parkway Line. Completed East Portal. PSC report 1918. 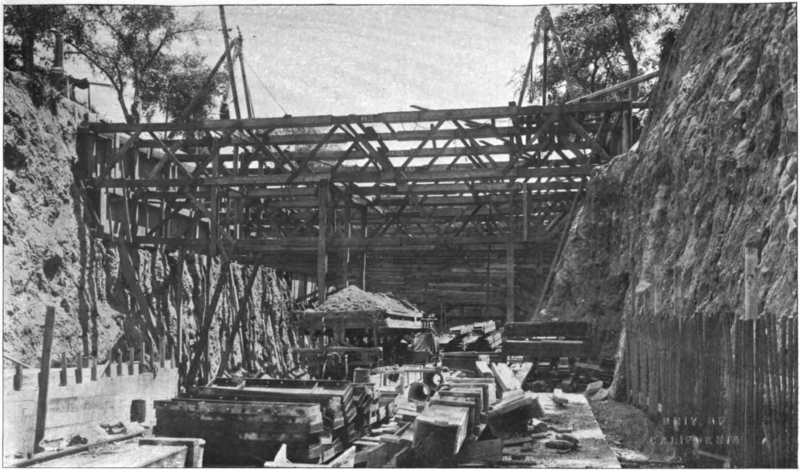 Eastern Parkway Line, Beginning of Elevated Structure of the Livonia Avenue Branch. PSC report 1918. Route No. 29, Section No. 1. 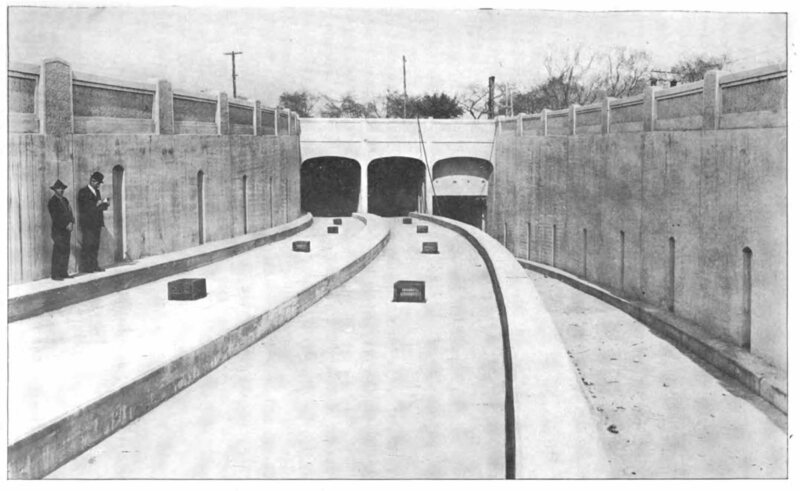 — This is a two-track subway, extending under Nostrand avenue from Eastern parkway to a point south of Church avenue. Contractor, Newman & Carey Company, Inc. Date of contract, August 30, 1915. Contract period, 21 months. Summary of contractor's bid, $2,073,303.70. Route No. 29. Section No. 2. 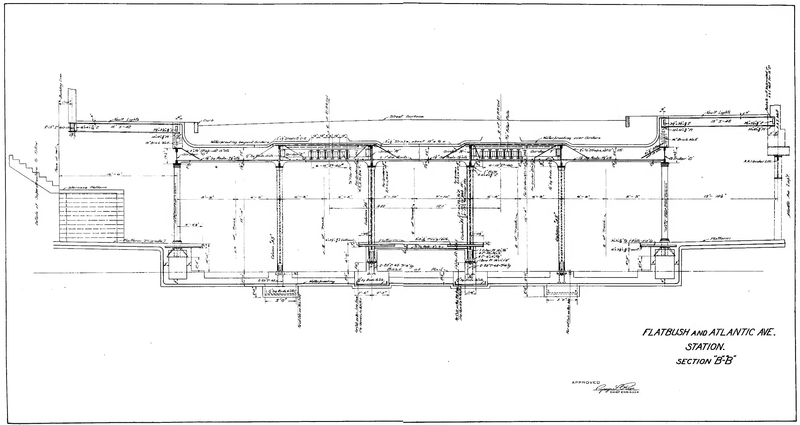 — This is a two-track subway extending from a point south of Church avenue, under Nostrand avenue, to the intersection of Flatbush avenue and Nostrand avenue. Dock Contractor Company, contractor. Date of contract, October 8, 1915. Contract period, 21 months. Summary of contractors bid, $1,602,730.70. Utica Avenue Line. 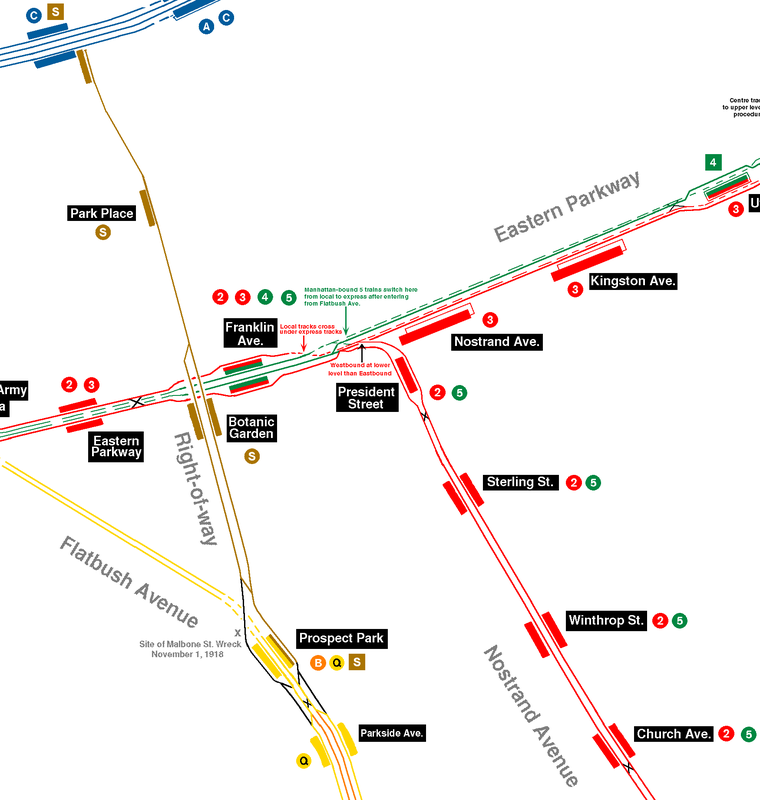 — This is a proposed three-track elevated railroad extension of the Eastern Parkway subway. It extends along Utica avenue from Eastern parkway to Flatbush avenue. The Commission has been requested to build this line and assess its cost on the property benefited. The work has been divided into two sections, namely Route No. 51, Sections Nos. 1 and 2. Route No. 51, Section No. 1. — Extends from Eastern parkway and Utica avenue along Utica avenue to about Clarendon road. 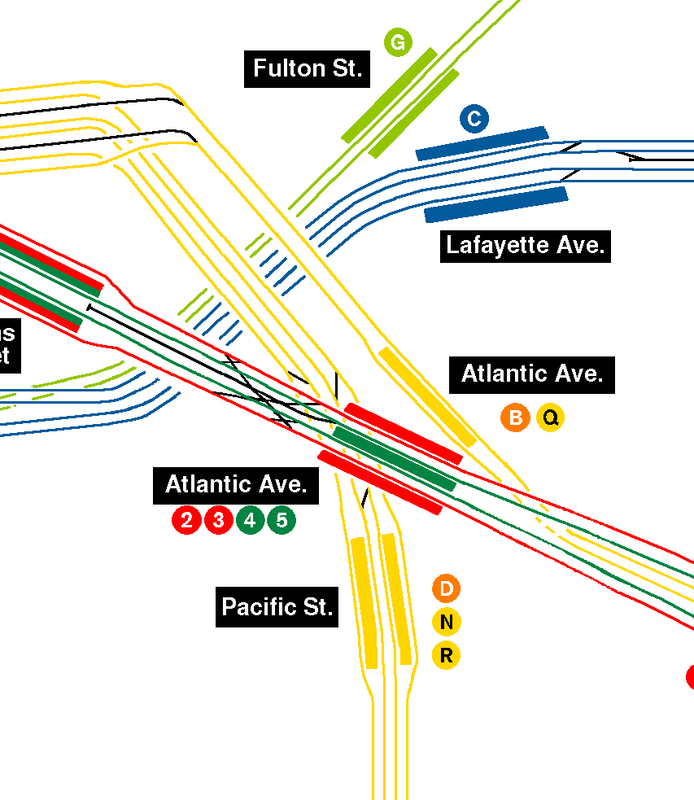 It consists of a two-track subway connection with the Eastern Parkway subway joining to a three-track elevated line on Utica avenue. Route No. 51, Section No. 2. — Extends along Utica avenue from about Clarendon road to Flatbush avenue. It is a three-track elevated railway throughout. After passing through the Joralemon Street Tunnel, the first station in Brooklyn is in fact Brooklyn's first subway station: Borough Hall (East Side Branch). This station is physically separate from the Borough Hall station serving the West Side IRT branch described above. 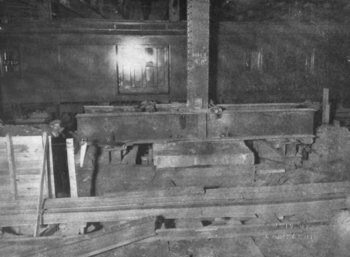 In the southeast corner of the mezzanine, a plaque commemorating the subway's arrival in Brooklyn is found. The platform and mezzanine walls feature an intricate intertwined "BH" mosaic. Also in the mezzanine is a remnant of New York's Past: a bank teller window which used to be served by a local bank. Some relatives depths of stations in the Borough Hall complex are as follows (measurements unscientific, +/- 10 feet). South of Borough Hall, the Contract I (East Side) and Dual Contract (West Side) IRT lines join to form a four track line, with a local (2/3 trains) and express (4/5 trains) layout. The Flatbush Avenue trunk line is quite complex, with the BMT Brighton Line trains using the two innermost of the six tracks in this area. The express tracks are at a lower level for a stretch. Hoyt Street station has four tracks and two side platforms. This station has been renovated extensively in the 1980s. Old signs on the center I-beams between the local and express tracks read "Hoyt Street/Bridge Street". There is a closed entrace to the Macy's department store behind a grille at the north end of the southbound platform, which also used to serve as a crossunder between platforms. At the south end of the northbound platform is a closed-off passageway used by the police. One of the original ceramic cartouches has been preserved at the New York Transit Museum. 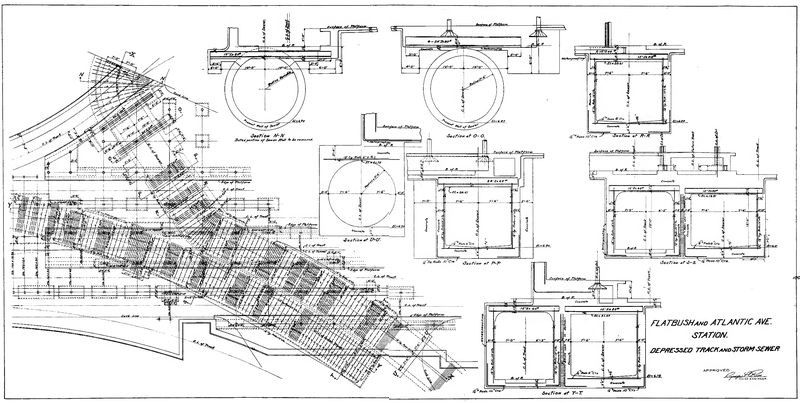 Cross-section of tracks at Hoyt St. Click to enlarge. 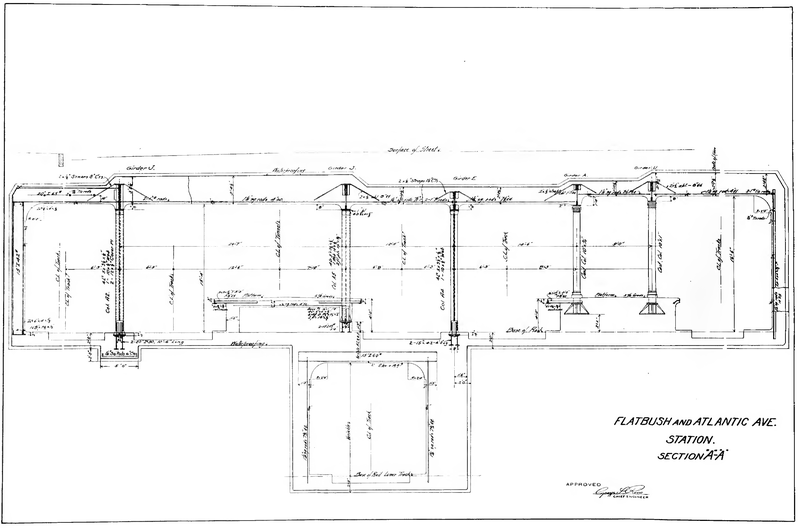 Plan of Hoyt Street Station. Click to enlarge. Four tracks, two island platforms. Disused lower level. The upper level has a wide space between the two express tracks. Originally, this station had the two express tracks plus a center track. 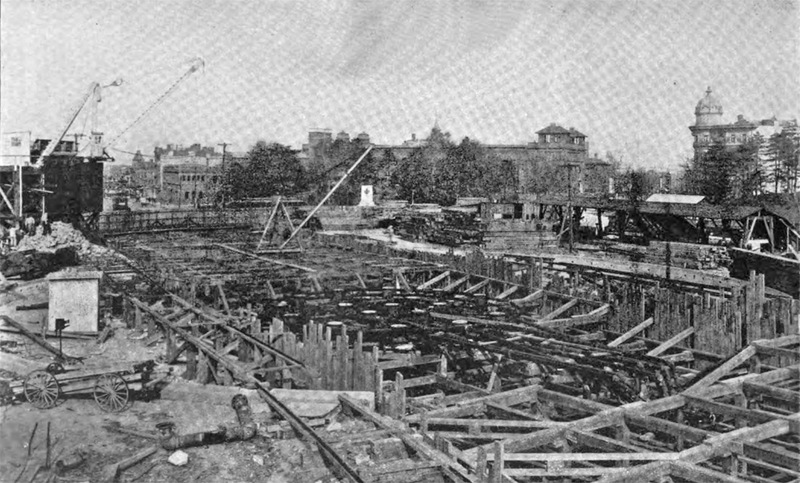 The local tracks were added later and at that time, the center track was removed. The platforms are offset. There is a nice "N" mosaic in this station. There is an underpass here, from which it had been possible to see an unused lower level platform and trackways. (For more information on this, see Brennan's Guide to Disused Subway Stations). This station has recently been renovated, and unfortunately, upon completion of the renovation, the temporary wall in the underpass which afforded the view of the lower level platforms has been replaced with a tile wall. Access to the unused platform is via a cellar-type door at the north end of each platform. Four tracks, two side and one island platform. Express trains use the island platform shared by the two center tracks while the locals use the two wall platforms. On the center platform there are two old indicator signs indicating next train, used for non-rush hour short turn trains. The trackway to the LIRR is still visible at the north end of the northbound local track although much of it is behind corrugated wall. Rumors abound about this trackway, including whether or not a track ever existed! Stan Fischler's book The Subway, in the chapter on Belmont's private car Mineola, suggests that it did. 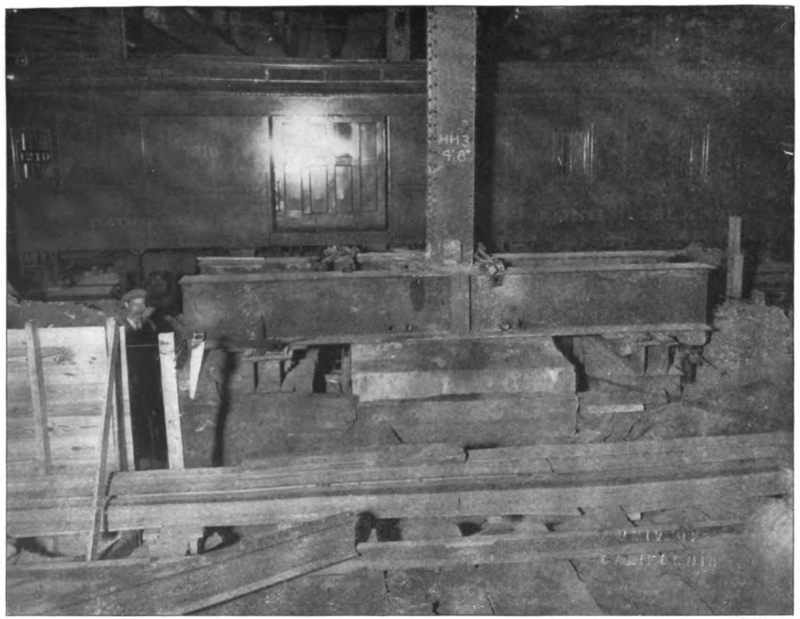 Other evidence indicates that if in fact track was ever laid in the trackway it was covered over by 1920 and disconnected entirely from the IRT and the switches removed in 1922. (A fine site discussing this LIRR connection is located at aRRts aRRchives.) The LIRR platforms are clearly visible on the other side of floor to ceiling railings. The northbound local trackway and track have been completely redone with concrete base and welded rail. An old style sign to the Brooklyn Academy of Music still exists. Cross-section at Atlantic Avenue station. Artwork Steps to the Subway, Tim Connor. Two tracks, one island platform. This station is very deep (approx. 100 feet below the street) and has rounded side walls indicating the deep bore construction of the under river tunnel. Access to the street is by elevator. The platforms have sailing ship mosaics and a large "Clark Street/Brooklyn Heights" mosaic name panel. The street level fare control has a directional mosaic to the Hotel St. George. Two level station with Brooklyn-bound trains on the lower level and Manhattan-bound trains on the upper level. There is a large Borough Hall mosaic and a picture of Borough Hall in the tile border. Two side platforms around four tracks. Standard Dual Contracts mosaics. No crossover or crossunder. A full curtain wall separates local from express tracks. Two tracks, one island platform. The island platform is unusually wide, as the two tracks of the Brighton Beach line are underneath. The only mosaic is a small "P". Two tracks, two side platforms. The express tracks are on a lower level. The large mosaics indicates Eastern Parkway and Brooklyn Museum. There is an emergency exit from the express level at the south end of each platform. There is a second, unused mezzanine, token booth, and turnstile area at the north end of this station (a very close look at the tiles in this area will reveal a door to this area). This entrance has been removed on street level. The Eastern Parkway-Brooklyn Museum station had a small tower at the south end of the northbound platform until the 1950s. There are four tracks and two island platforms. A free transfer to the BMT Franklin Shuttle's Botanic Garden Station was added in 1999. This is also the last chance to transfer between New Lots and Flatbush Ave. trains. Two tracks, single island platform. This is a deep station, and there is an escalator that leads to the mezzanine (which has a crossover), three flights up. The mosaic tiling is limited to the small P. An old sign on the escalator advises us: "Do Not Rest Umbrellas or Canes on Escalator." Two tracks, two side platforms. Standard Dual Contracts mosaics. Student art is featured in the mezzanine which has a crossover. A newsstand is in the mezzanine. Two tracks, two side platforms. Standard Dual Contracts mosiacs. There are old signs to the Downstate Medical Center. No cross over or cross under. The southbound fare control is ten steps up from the platform while northbound fare control is at platform level. Mosaic directional signs to Winthrop Street also exist northbound. Two tracks, two side platforms. Recently renovated. Fare control is at platform level. Two tracks, two side platforms. Standard Dual Contracts mosaics. This station unfortunate distinction of having its name spelled incorrectly in the mosaic tiling. The new signs are correct but the mosaic omits the second 'e' as does the token booth (at platform level) and the platform extensions of the 60s. I found evidence of a closed crossunder. There is no crossover. Two tracks, two side platforms. There are standard Dual Contracts mosaic name tablets. All fare control is at the platform level. The southbound platform has an extra exit, also at platform level at the north end. There is evidence of a closed crossunder at the south end of both platforms. Two tracks, two side platforms connected in a "U" shape at the south end where the fare control is located. Elevators allow access to the street. This was not meant to be a terminal station. The line was mapped to continue in Nostrand Avenue to Sheepshead Bay. 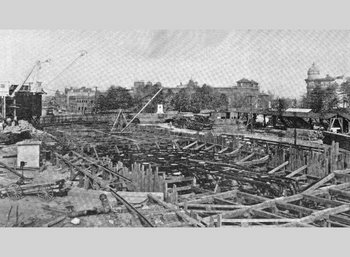 The contract was in two or more sections of which only the one, ending at this station, was built. To accommodate a crossover, the south end entry at Avenue H was added on slightly after the station's opening to make the U-shape platform. Indicia of the more recent construction of this exit are seen in the tilework. Other indications were in the floor and walls but these were covered over in the mid 1990s reconstruction. It was agitated for by the local community leaders during the mid 1990s renovation to open an exit on the west side of Flatbush Avenue next to Brooklyn College. This was not done. The room for this exit was given to utility and crew space. There was on the south side of Avenue H between Nostrand and Flatbush Avenues a substation for the BMT trolley and subway. It was demolished around 1960. There remain today manholes in Avenue H for the BRT and BQT from this substation. The site is now a city carpark for park-and-ride customers of the IRT. It is virtually empty despite the huge increase in riders from growth around and south of the station. The community is urging to build a bus and van depot here with direct entry into the station. So far nothing has come of the idea. For many years this station and Newkirk Avenue station were plagued with flooding in heavy storms. The water literally overflowed the trackway and platforms. The cause was a refilling of the local water table with no withdrawal from it. There was from before the subway the the Flatbush Water Company on what is now the grounds of Brooklyn College. It drew off of the ground water for its supply and thus kept the level lower than the stations. 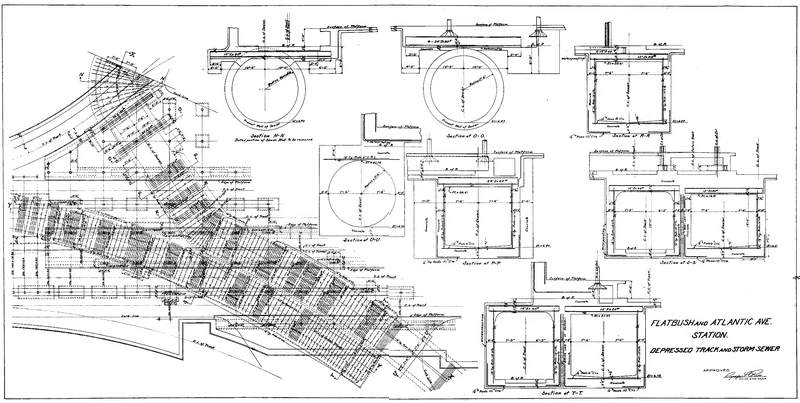 Recall that waterproofing was done mainly when the route descended below the water table. The water business folded in the 1930s, freeing the land for the College. But there was no more drainage of the water and the ground gradualy recharged to overflowing. By the mid 1950s flooding at Flatbush and Newkirk stations was routine and disruptive to the service. Many times trains were turned at President Street or Church Avenue or the line was closed completely. Riders were sent upstairs to buses sent out to continue the run to Flatbush Abenue. Fixups in the 1960s and early 1970s were unsuccessful. In the 1980s a final solution was worked out by waterproofing the structure and laying in larger storm mains. Now the trains flow into and out of Flatbush Avenue regardless of the weather upstairs. Two tracks, two side platforms on two levels. Standard Dual Contracts mosaics. The fare control is on the outbound (upper level) platform. At the south end you can see the Flatbush Ave. line turn off. Two tracks, two side platforms on two levels. Two levels with two tracks and one island platform on each level. Through trains to New Lots use the southern half of each platform, and terminating trains use the northern half (inbound on the upper level, outbound on the lower level). There is an an active tower at the south end of the upper level platform, and a closed one on the lower level paltform. In the station there are ornate doors in the tile walls which serve as vent chambers for the station. The station was recently renovated including sun and moon artwork on the trackside walls. Although named for Utica Avenue the station lies from Schenectady Avenue to about 2/3 of the way to Utica Avenue. There are no exits at Utica Avenue itself. This displacement away from Utica Avenue allows sufficient easement for the IRT's Utica Avenue line, plans for which were proposed as far back as the 1930s by both the IRT and in IND Second System plans. To accomodate the expansion proposals, the line east of the station divides into three routes. Just outside the station on the local track are bellmouths leading south in Utica Avenue for the proposed Utica Avenue line. This was not preempted by the later IND plan for such a route but an alternative. From time to time the one or the other plan is resurrected, only to sink and die again. East of Utica Avenue the tracks in the tunnel split into the present New Lots line and a set of layup tracks. These tracks lie under Pitkin Avenue and are intended to continue the IRT east in that street. 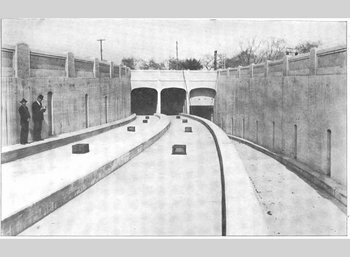 The tunnel mouth between Utica Avenue and Sutter-Rutland is an early example of a split-level portal. The three tracks of the Livonia Avenue line start to diverge on the el and are well separated as they enter the tunnel. Leaving the subway, the line to New Lots Avenue is a standard Dual Contracts elevated line. The structure has two tracks (except at Junius Street which has a center track used to access the Linden Yard). 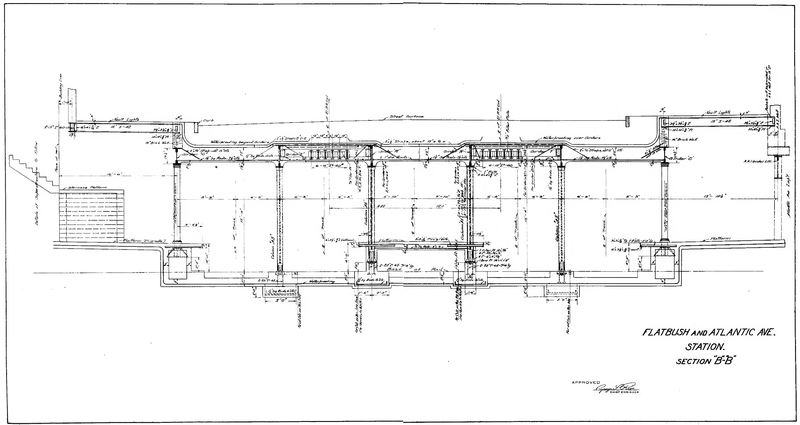 The structure is wide enough throughout its length for a center track and evidence in the stations above the mezzanine shows a partial third track existed in all stations except New Lots and Junius Street. This partial track has the trackway plus cross ties set into the concrete but no rails. I have no information as to whether there were rails and they were removed or if the trackway with cross ties is the end of the idea for a third track. Along part of the line, the space is used for various signal rooms and mechanical rooms. The stations are all fairly nondescript elevated stations. There are no crossovers except at Junius Street. 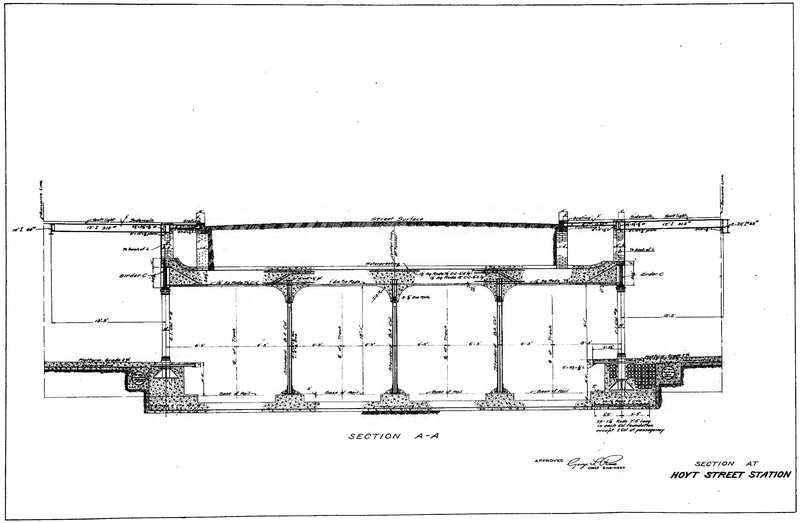 The first elevated station is at Sutter Avenue/Rutland Road, which is over East 98th Street. This station has full canopy on the north end and no windscreen on the south end. Two tracks, two side platforms. This station has an extra exit from the southbound platform bypassing the fare control, which was used for PM rush exit only. In the mezzanine is an old enamel white on navy blue "To Street" directional sign. There is only one stair from fare control to each platform. Three tracks, two side platforms. Three tracks, two side platforms. At the southbound end the center track crosses the eastbound track into Linden Shops. There is no switch. This station has full windscreen. Outside of the fare control is an overpass allowing pedestrians on Livonia to cross over the L tracks. As our train leaves the station you can see the Livonia Avenue station of the L train beneath us and to our immediate right. Two tracks, two side platforms. Room for center express track, never used. Two tracks, one island platform. This is a terminal station, but the tracks continue beyond the station and end in Livonia Yard. This is the only elevated terminal station where the tracks continue in this manner; all the other elevated terminals end in bumper blocks. The station has an active tower and crew quarters at platform level. Subway to Brooklyn Opened For Traffic, New York Times, January 9, 1908. "First Regular Passenger Train Went Under the East River Early This Morning. NOT A HITCH IN THE SERVICE Gov. Hughes and Brooklyn Officials to Join in a Formal Celebration of Event To-day. SUBWAY TO BROOKLYN OPENED TO TRAFFIC." 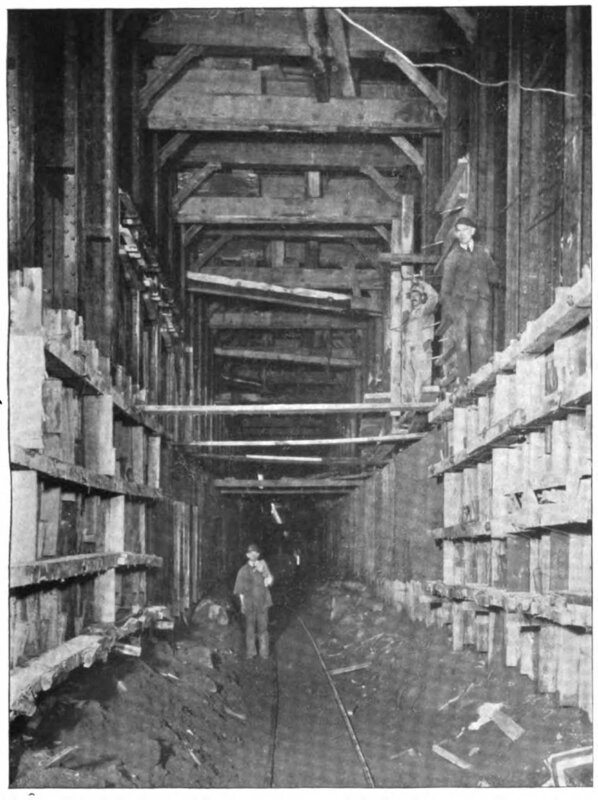 Brooklyn Joyful Over Its Tunnel, New York Times, January 10, 1908. "Borough Square Thronged for Celebration of First Official Trip Under the River. TUNNEL ROUTE QUICKEST Test Shows a Gain of Six Minutes by That Way Over the Old Bridge Route." 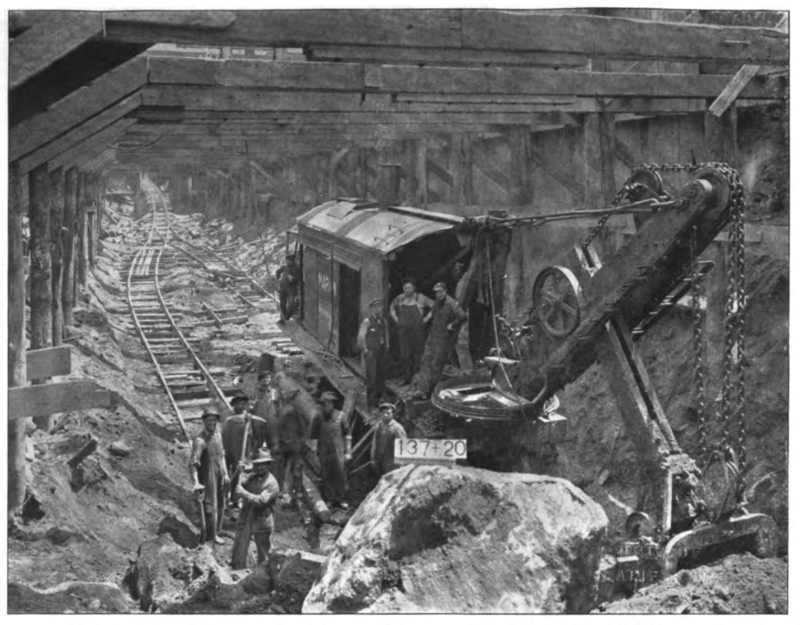 First Train Through Subway Extension, New York Times, May 1, 1908. "Went at 1:02 A.M. from Bowling Green to Long Island R.R. Station, Brooklyn. BIG CELEBRATION TO-DAY Followed by a Civic and Military Parade To-night with Lots of Music and Red Fire." Brooklyn Joyful Over New Subway, New York Times, May 2, 1908. "Celebrates Opening of Extension with Big Parade and a Flow of Oratory. AN ODE TO AUGUST BELMONT Anonymous Poet Calls Him "the Brownie of the Caisson and Spade" -- He Talks on Subways." New Clark Street Tunnel Completed, New York Times, March 16, 1919. 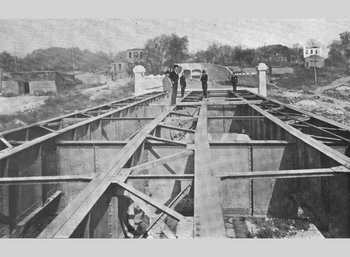 Also from the New York Times: Clark Street Tunnel Ready (April 11, 1919), Clark Street Tunnel Tested (April 12, 1919), Fear B.R.T. Strike- Rush Use of Tunnel (April 13, 1919), New Subway Service Between Brooklyn and Manhattan Boroughs (April 13, 1919), Open Clark Street Line (April 16, 1919), Lessens Subway Crush (April 17, 1919), Dual System is Nearly Completed (May 4, 1919). Under-River Tunnel Headings Meet (Old Slip-Clark Street Tunnel), Public Service Record, December, 1916.